I am trying to replace my fuel filter and can;t seem to. It is in a bail underneath the fuel pump. I cant get any of it to move. My car cuts out going up hills and i figured it was either the fuel filter or it needed a new fuel pump. Any help would be awesome. It should look something like this. That type in pic you unscrew clockwise looking DOWN on a finger nut. Some metal bowl types use a hex nut and can also take a flathead screwdriver. Some bails will only move so far out of the way but enough to remove this bowl idea thing. 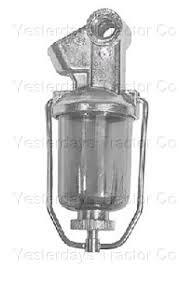 Filter should come with new gasket for this type. If this is rubber line already from pump to carb then consider an inline filter and this type can be put back without the filter but still would collect water which was the reason for this type and clear ones you could see it. Not sure what came with this new but I'd bet a fuel pump without this is available to fit if this is too much of pain (most were cool) and put a filter after it in line. Watch where fuel line is routed and keep metal as much as possible keeping in mind this is fuel under pressure around hot engine parts and sparks possible! That particular one look more like ones GM used at the carb inside a screw in housing. There would be some indication of a hex nut/bolt or it may have unscrewed entirely off like an oil filter and the metal had external threads into the bottom housing of the fuel pump. Egad - my memory is pretty good but that had to be some 35 years ago an one broke on me or wouldn't thread in (the housing) and those were in stock as it was common I guess.